This year the Hands & Voices Leadership Conference brought cultural diversity to the table. A group of seven women, moms and clinicians whose cultural heritage represents many corners of the world, participated in a discussion panel. Cultural diversity is a topic we need to discuss so we can better serve families from different cultural backgrounds. Culture is the integrated pattern of learned beliefs and behaviors (Nunez, 2006; Betancourt, 2003). It explains how we view and value the world. It is influenced by socioeconomic status, religion, sexual orientation, occupation, etc. (2006, 2003). Culture is the way we think, act, and interact with others. People from the same race do not necessarily share the same culture. As service providers, we should practice, grow and master our cultural competence skills. Cultural competence allows us to determine the social and cultural influences in a person’s health beliefs and behaviors. It is the ability to interact with people who are different than ourselves (Nunez, 2006, Dy, 2011). Different cultures have different reactions to a diagnosis of hearing loss. Those reactions influence how and when we seek support. As parent-guides we can help families access support services sooner rather than later if we can connect with them and understand where they are in their own journey. Our Connection: As parent-guides serving families from different cultures, we need to keep in mind that there is a common connection between us and the DHH families that we serve, and that the connection is the common diagnosis. This is an unbreakable bond that will open the door for us to serve and support those families. Language and translations: Language barriers also create challenges. Terms in English may not reflect the same meaning in different languages. Families need to understand exact terminology, be able to share the correct information, and exchange viewpoints about their child’s care to ensure a clear understanding of the decisions they make on behalf of their children. Are we connecting families with similar backgrounds so that they can feel a sense of familiarity especially at a time when everything is new and unknown? Family preferences: We need to understand where each family is in their own journey. Find out about the families’ view of hearing loss, and support them accordingly. For instance, after the diagnosis some families are comfortable jumping in and starting an action plan. However, other families may need time to absorb, digest, and understand what their child’s diagnosis means to them and how they choose to approach the decisions they need to make regarding their child’s language acquisition, education, and even medical or professional treatment. It is important to provide a wide variety of opportunities for engagement. Small intimate gatherings are just as effective as big social events. Educational opportunities both virtual and real-time can bring important information. Resources should be accessible at a time that is convenient for families. We need to keep our hand on the pulse of the family when it comes to introducing new supports, like a deaf mentor, support group, family activities, etc. Extended Families: Extended large families also play a role in many cultures and may impact how we support certain families. As members of Hands & Voices, we already know that it takes a village to raise a Deaf or Hard of Hearing Child. It is important to think about grandparents’ or other family members’ views on deafness or Hard of Hearing, and how we can include and involve them in our efforts to serve and educate their families. We should pay close attention to each family’s dynamics and preferences, be aware of cultural influences, and offer our support accordingly. We are not alone. We all are constantly navigating others’ beliefs and behaviors. Finally, we should ask for help when in doubt, or if we think we are running short of resources. We are here to help each other help more families succeed. Thank you to Rana Ottallah & Rosabel Agbayani parent-guides for their input in writing this summary. 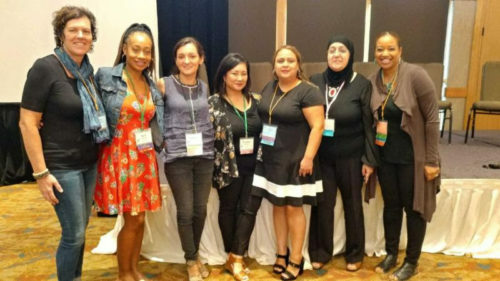 Thank you to all the panel participants for the content of this summary: Apryl Chauhan (CA), Yiesell Rayon (HQ,CA), Janet DesGeorges(HQ), Djenne-amal Morris (HQ), Rana Ottallah (LA), Rosabel Agbayani (CA), and Alejandra Ullauri (IL). Betancourt, J.R. (2003). Cross-Cultural Medical Education: Conceptual Approaches and Frameworks for Evaluation. Academic Medicine, 78(6), 560-569. Dy, C.J., Nelson, C.L. (2011). Diversity, Cultural Competence, and Patient Trust. Clinical Orthop Related Research 469, 1878-1882.